In the village we live in there is a longstanding tradition (my mum remembers going every week when she was little) of a roller disco on a Friday night. It's not every week, but is pretty regular throughout the month. For the first year that we lived here, I didn't tell my children that it existed. Not because I'm a mean mum, but because more often than not, we can't go at the weekend due to B&B guests arriving. Last summer I took them for their first roller disco and they loved it! Then once the B&B season drew to a close, we've been far more regularly. My son is absolutely fantastic and took to it really quickly. He's after some roller-blades for his birthday this year. He's pretty sporty, so it makes a lot of sense that it's another sport he's good at. I have to admit that it's great to see the children haring around, doing tricks on wheels, and none of them are embarrassed, they're just there to have fun! My daughter has been a little more hesitant. She's a girl who doesn't like to do something until she can do it to the best of her ability. It makes things like roller skating a little tricky! A couple of other older girls have a pair of Heelys, and my daughter is adamant that's what she wants for her birthday. I'm not sure how well they would work with the amount of cobbles we have here, but I think they might be a great way for her to master balancing on wheels. 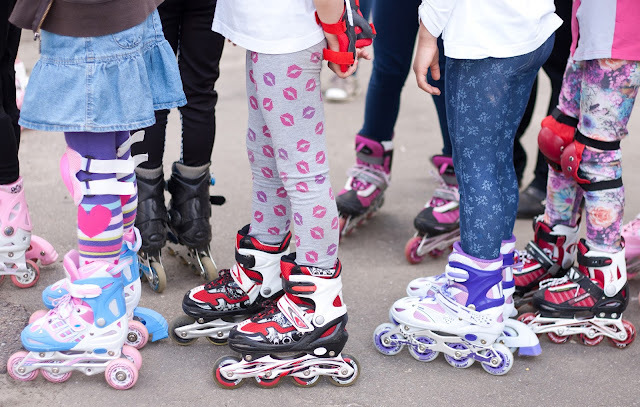 I recall having a great time on roller skates when I was younger and have contemplated donning a pair at the roller disco, but I wouldn't want to show the kids up break an ankle! For now, I'm happy sitting on the sideline watching the fun. We've also been encouraged to bring wine with us, to make it more pleasant for the parents! I am definitely not looking forward to the B&B season starting in force again, I've got far too used to a weekend roller disco! This post is in collaboration with Heelys.